17. dxc6! !, Rxd1/ 18. cxb7, Kb8 /19. Rfxd1, Bc5/ 20.Bxc5, Qxc5/ 21. Rd7, f5/ 22. Rad1, Nc6/ 23. Na4, Qb5/ 24. Rdc1! (exchanging pieces does not diminish the strength of the attack, and this is one of the most difficult things to realize in advance) 24… , Qxa4/ 25. Rxc6, Qxa5/ 26. Rxe6, Ka7/ 27. g3, g5/ 28. Rxh7!! , Rb8 (the point is that if now 28…, Rxh7, then 29. b8Q! !, Kxb8/ 30. Re8, Ke7/ 31. Ra8, Kb6/ 32. Rb8, Ka7 33. Rb7! winning) 29. h3, g4/ 30. hxg4, fxg4/ 31. Bg2, Qa1/ 32. Kh2, Qxb2/ 33. Rh-h6, Qa2/ 34. Re-f6, c5/ 35. Rf4, Qd2/ 36. Bf1, Rxb7/ 37. Rxa6, Kb8/ 38, Rf8, Kc7/ 39. Bg2, Qd7/ 40. Rh8, c4/ 41. Be4, Black resigned. Study by A. Gurvich, 1927.White to move wins. Of course , one can make “experiments”: let’s suppose your favourite lines against 1.e4 and 1. d4 are the Caro-Kann and the Orthodox Bondarevesky/Makagonov . It seems you are a positional player. One day you are in high spirits and in an official ICCF event against an IM you decide you can play everything and if your opponent plays 1. e4 you choose the Sicilian Najdorf and if he plays 1, d4 you choose the Volga Gambit for the first time in your life… Well, I tend to believe that instead of an innocuous experiment in a 99% it will mean sheer suicide. 1.- Chess is a difficult game. Making moves is easy. Playing Chess, and more in official events, isn’t. 3.-The way super GMs play may be deceptive: there is an immense work behind the apparent easiness they show when playing their games. 5.- During your Chess career there will be times when you feel “stuck” feeling you are not progressing anymore. The best thing to do is to realize that not all progress is “vertical”. There are “horizontal” levels to go through before mounting a new step up. 6.- In Chess there is no permanent goal/state which can be achieved forever. Everything is changing. Remember that even superGM grow, reach their personal peak and slowly begin to decline. It is one’s ability to readapt oneself what counts. 7.- Keep an open mind, check and test facts and ideas, try to find answers to questions , avoid playing by inertia, avoid falling in destructive states of mind caused by boredom. You may say this is easier than done. Yes, but most of us have passed or are passing through the things exposed above. Everybody has many deserts to cross through his/her life. 25. fg5 , hg5 26. Ba3 , Ba3: 27. Ra3:, Bd5 28. Bd3 , Red8 29. Re1 , Rc7 30. Re3 , Kf6 31. Ba6 , f4 32. gf4 , gf4 33. Rd3 , Rh8 (a second target. Now White can play c4 but to no avail) 34. c4 , Ba8! 35. Rh3 , Rg7 36. Kf2 , Rg2 37. Ke1 , Rh2: 38. Rh8: , Rh8: 39. Nf3 , Rd8 40. Kf2 , Bf3: 41. Kf3:, Rd4: 42. Rc3 , Nc6 43. Bb5 , Ne5 44. Ke2 , Kf5 45. c5 , f3 46. Ke1 , bc5 47. Rc5: , Kf4 48. Rc7, Ke3 49. Re7 , f2 50. Kf1 , Rg4 and Larsen resigned. Solution to study: 1. Ne4 , Nd3 2. Qf2!! Nf2: 3. Ng3 Kg1 4. Ng5 and mate follows. Sometimes , analysing is somewhat easier when we have the notes by the players involved. GM Nunn has published excellent books analysing his games. In other cases, the analyst carries out an excellent work because he puts a lot of effort in his task, checking and re-checking his analysis (I have several of these in my library, and one of them is Soltis’ book on Bobby Fischer. Another one well worn-out by use today is One of the first Karpov book analysing his best Chess games between 1969 and 1974, with an appendix written by Tal analysing Karpov’s style. I still consult it whenever I want to know how to play certain types of positions.) These deeply annotated games help you to understand many other games played by the same player or with the same opening variation. 3.- Instant notes to games for newspapers/magazines are not reliable, even those made by GMs. 5.- When books , even those by GMs are written for commercial/financial purposes alone, the notes in them tend to be superficial and may contain many holes. 6.- No GM will give away any of his/her secrets no matter the depth of the notes. This is why when we try to blindly imitate them we always perceive that odd feeling of “something-is-missing-here-and-I-don’t-know-what.” Or that of “This-or-that-GM-recommended-this-in-his/her-analysis-and-I-was-defeated-when-I-used-it-in-one-of-my-games”, etc. 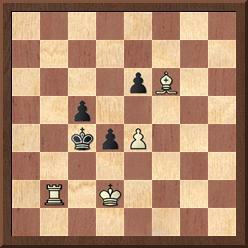 This is the position from the seventh game of the 1978 match Korchnoi – Karpov. Nor even GMs present there realized that after 42. Qh8+ (sealed) it is a draw. 1. d4 Nf6 2. c4 g6 3. Nc3 Bg7 4. e4 d6 5. Be2 0-0 6. Bg5 c5 7. d5 e6 8. Nf3 h6 9. Bf4 ed5 10. ed5 Re8 11. Nd2 Nh5 12. Bg3 Bg4 13. 0-0 Ng3: 14. hg3 Be2: 15. Ne2: Bb2: 16. Rb1 Bg7 17. Rb7: Nd7 18. Nf4 Nb6 19. Re1 Bc3 20. Ne4 Be1: 21. Ne6 Bf2: 22. Kf2: fe6 23. Qg4 Rf8 24. Kg1 Rf6 25. Qh3 Qf8 26. Ng5 Rf1 27. Kh2 Rf5 28. Ne6: Rh5 29. Qh5: gh5 30. Nf8: Rf8: White resigned. 5. cd5 cd5 6. Nc3 Bg7 7. e3 0-0 8. Nge2 Nc6 9. 0-0 b6 10. b3 Ba6 11- Ba3 Re8 12. Qd2 e5!! 13. de5 Ne5: 14. Rfd1 ?! (Rad1) …, Nd3 15. Qc2 Nf2:! 16. Kf2: Ng4 17. Kg1 Ne3 18. Qd2 Ng2!! 19. Kg2: d4! 20. Nd4: Bb7 21. Kf1 Qd7!! White resigned. In the next posts I am going to include some studies for you to solve. I have chosen those with very short solutions (4-5 moves). Have a try at all of them to sharpen your tactical skills. I will give the solution. You will have to check the possible variations, etc. On the other hand, I have prepared new interesting posts for the next weeks. I hope you enjoy them. 1. e4 , c5 2. Nf3, Nc6 3. d4, cd4 4. Nd4: , Nf6 5. Nc3, d6 6. Be3, Ng4 7. Bg5 , Qb6 8. Bb5, e5 9. Nd5, Qd4: 10. Qd4: , ed4 11. Nc7, Kd7 12. Na8: ,h6 13. 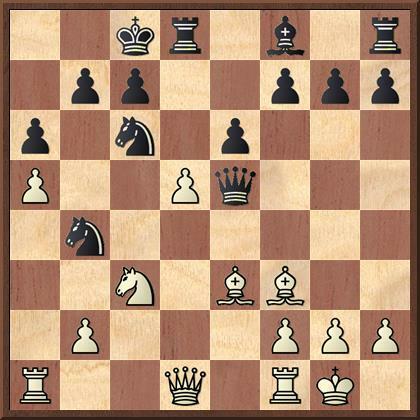 Bd2 , Kd8 14. a4, Bd7 15. a5 , Kc8 16. 0-0, Kb8 17. Nb6! ,ab6 18. ab6 , Nce5 19. Be2, g5 20. Ra5 , Nc6 21. Ra4, Be7 22. Rfa1, Kc8 23. Rd4:!, Nge5 24. Ra8, Nb8 25. Bb4, Bc6 26. Bd6:, Bd6: 27. 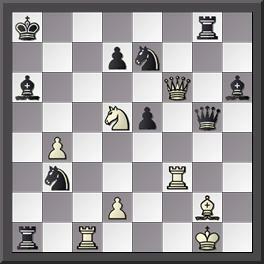 Rd6: , Be4: 28. c4 , g4 29. b4 ,h5 30. Ra5 , Nec6 31. Rh5:, Rh5: 32. Bg4: Rf5 33. f3, Bc2 34. Rf6 , Nd4 35. Rf7: , Nd7 36. Bf5: ,Bf5: 37. c5, Kd8 38.h4, Ke8 39. Rg7 ,Kf8 40. Rg5, Ne5 41.Rh5, Ke7 42. Kf2, Kf6 43. Rh6, Ke7 44. Rd6, Nd3 45. Kf1, Nb5 46. Rd5, Ke6 47. c6! ,Nb4: 48. cb7, Nc6 49. Rd8! , Nd6 50. Rc8! , Bd3 51. Kf2, Ba6 52. Rc6: Bb7: 53. Rc7 Black resigned. 1. e4 , e5 2. Nf3, Nf6 3. Bb5, a6 4. Ba4, Nf6 5. 0-0, Nxe4 6. d4, b5 7. Bb3 , d5 8.de5 , Be6 9. Be3 (an old move deviating from the normal paths), Nc5 10. Nc3, Nxb3 11. cb3!, Be7 12. Rc1, Qd7 13. Qd2, 0-0 14. Rfd1, Rad8 15. Bg5, d4 16. Ne4, Bd5 17. Qf4 , Bxg5 18. Nfxg5, Qe7 19. Rxc6!, Bxc6 20. Nf6!, gf6 21. Nxh7!, Kxh7 22. Qh4, Kg7 23. Qg4, Kh8 24. Rd3, Be4 25. Rh3 ,Bh7 26. 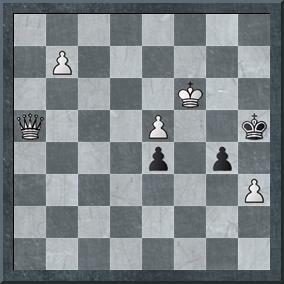 Qf5 and Krasenkov resigned. 1. e4, e6 2. d4, d5 3. Nd2, c5 4. ed5, ed5 5. N1f3, Nf6 6. Be2, Nbd7 7. 0-0, Be7 8. b3, 0-0 9. Bb2, Bd6?! 10. c4, cd4 11. cd5, Nxd5 12. Ne4!, Bc7 13. Qxd4, N7f6 14. Nxf6, Qxf6 15. Qd2 , Qf5 16. g3, Rd8 17. Nh4, Qh3 18. Qg5, f6 19. Qh5, Be6 20. Bd3, h6 21. Qg6, Nf4 22. Qh7, Kf8 23. Bxf6 gf6 24. Qxh6, Kg8 25.Bh7, Kf7 26. Bg6, Nxg6 27. Qxg6, Kf8 28. Qxf6, Kg8 29. Rfe1, Re8 30. Qg6, Kh8 31.Re4, Bd7 32. Qf7! and Knaak resigned. 1.d4, d5 2. Nf3, Nf6 3. c4, c6 4. Qb3, dc4 5. Qxc4, Bf5 6. g3, e6 7. Bg2, Nbd7 8. Nc3, Be7 9. 0-0, 0-0 10. e3, Rc8 11. Qe2, c5 12. e4, Bg4 13. dc5, Nxc5 14. Rd1, Qb6 15. h3, Bh4 16. g4, Bg6 17. Ne5 ,Rfd8 18. Be3, Qb4 19. Nxg6 , hg6 20. e5, Ne8 21. Nb5, a6 22. Nd4, Na4 23. Rd2, Rc7 24. a3, Qa5 25. Qd1!, Nb6 26. Nxe6!, fe6 27. Rxd8, Bxd8 28. Qxd8, Kf8 29. Rd1, Nc4 30. b4, Qa4 31.Bc5, Kg8 32. f4, b6 33. Bf2 ,Rf7 34. Rd4,Nxa3 35. Rd6!, Rxf4 36. Rxe6, Rf8 37. Bxb6, Nc4 38. Rxe8! , Rxe8 39. Bd5 and Shavalov resigned.